Jack DeGroff, ? ; Walter Collins, ‘48; George Quinn, ‘43. Boy between Tommy Scott and Jessie Overton - Unknown. Boy between Billy Braithwaite and Billy Lohman - Unknown. 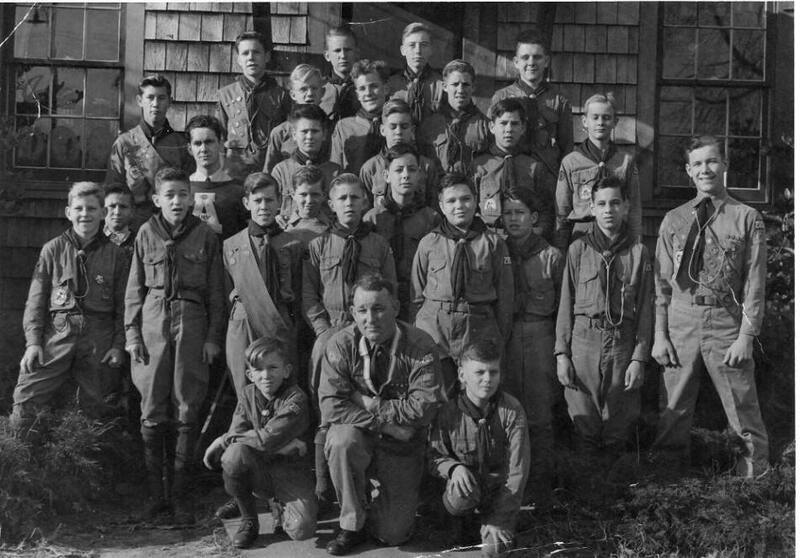 Boy between Billy Lohman and Herbert Cummings is Bobby Woody, Class year unknown. Jack Perkins, ‘47; Dickie Blanks, ‘46; Gordon Hearne, ‘46. Forth Row: Jimmy Braithwaite, ‘44; Presley Powell, ‘47; Jimmy Monaghan,’45; Kermit Cutchins, 44. Back Row: Johnnie Scott, ‘44; Harold (Unk) Barnes, ? ; Joe Rosendale, ‘44 and R. O. Payne, ‘44. Gordon Hearne, Jimmy Braithwaite, :Presley Powell, Johnnie Scott and R.O. Payne all made Eagle Scout. Troop cabin on Nicholson Street. The Troop is no longer active.